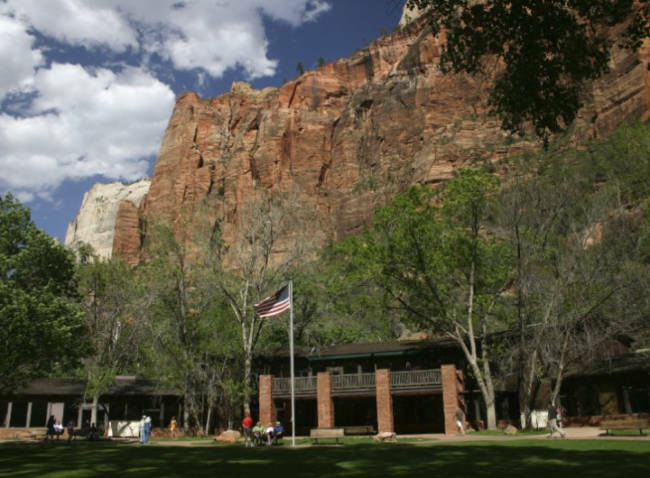 Zion Lodge is located inside Zion National Park and offers easy access to excellent hiking and other outdoor opportunities. The original lodge burned down in 1966, but the rebuilt structure convincingly re-creates the classic look of the old inn. 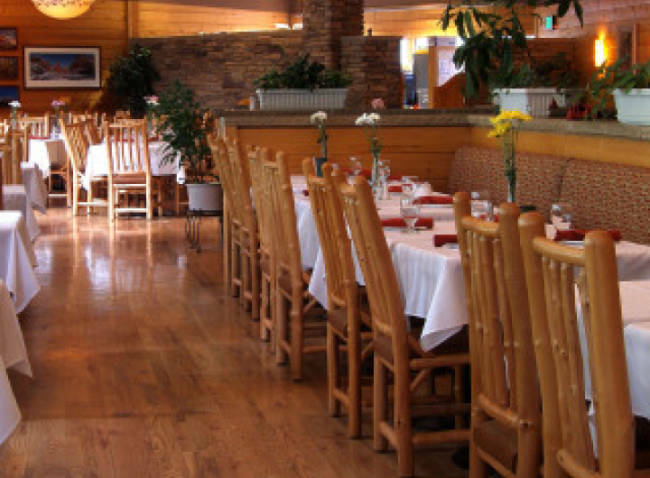 Knotty pine woodwork, log and wicker furnishings accent the lobby. Hotel rooms are modern, but not fancy and come with either two queen-size beds or one king-size bed, full bath, 37-inch TV with satellite reception and private porch or balcony. 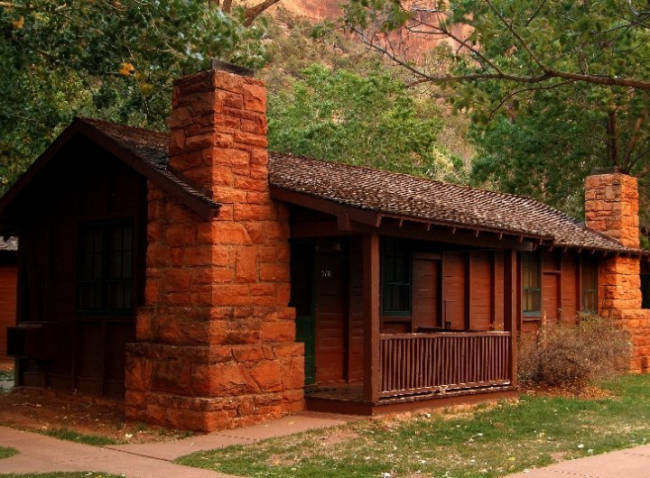 Along with hotel rooms, Zion Lodge features historic cabins with either two double beds or one queen-size bed, full bath, gas log fireplace, and a private porch. All rooms feature air conditioning, phones, radio alarm clocks, and hairdryers. The lodge is open year-round, and features special winter rates and packages December through mid-March. 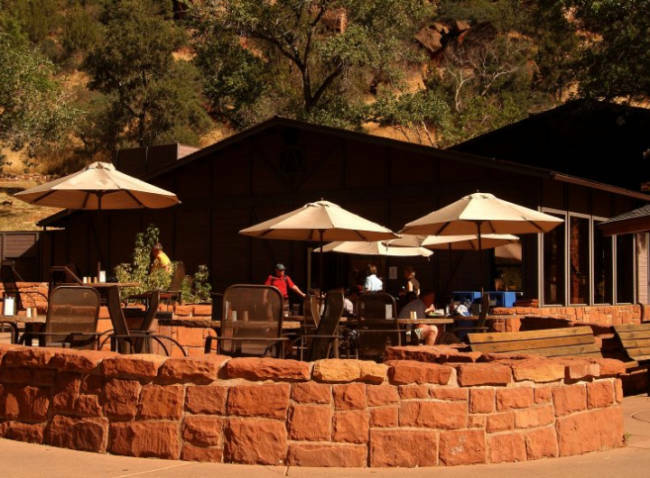 Amenities of the Zion Lodge include complimentary Internet, a kiosk in the lobby, 24-hour front desk, and the Red Rock Grill which serves breakfast, lunch, and dinner. 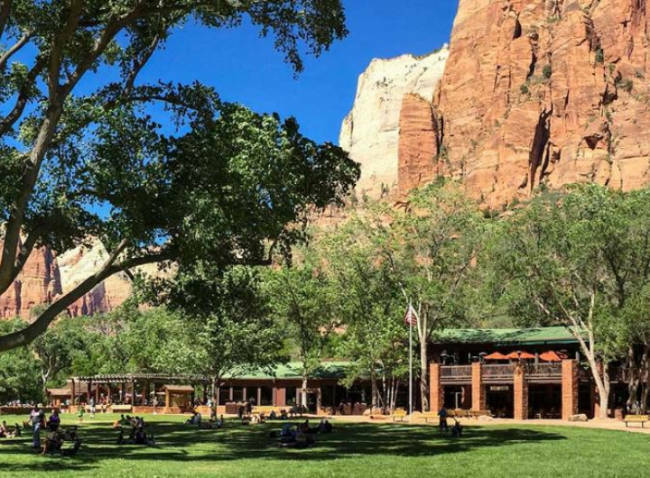 Check in time is after 4:00 p.m. and check out time is by 11:00 a.m. Group reservations must be checked out by 10:00 a.m.
As with all national parks lodging it is best to make your reservations as early as possible. 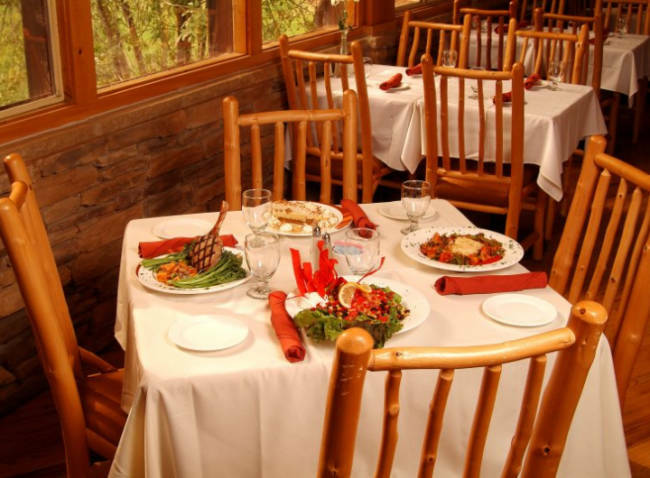 At Zion Lodge, it is best to make reservations at least one year in advance for the peak seasons of spring, summer, and fall. 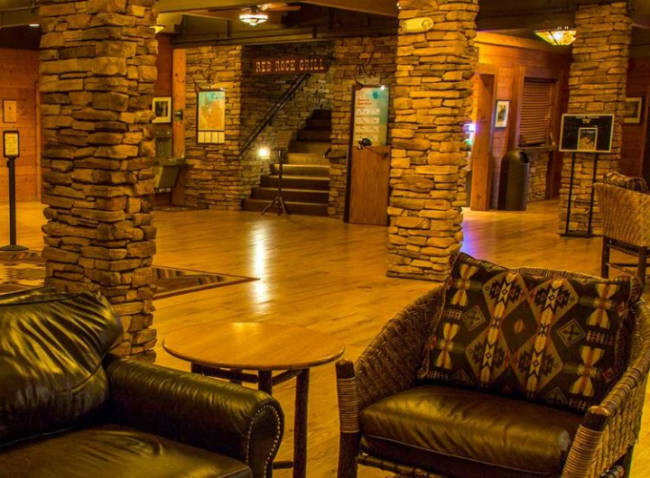 This lodge is great for a true national park getaway. You’ll enjoy the convenient location at the end of a long day of sightseeing and activities in the park. 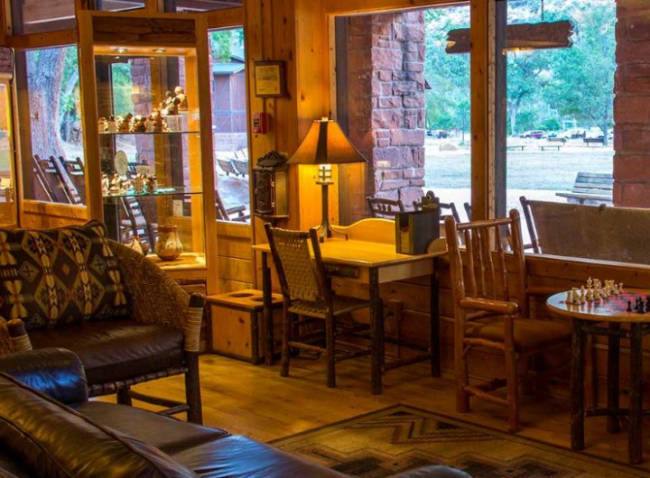 The lodge is within an easy walking distance of trailheads, horseback riding, and, of course, the shuttle stop, all of which are less than 1/2 mile away. 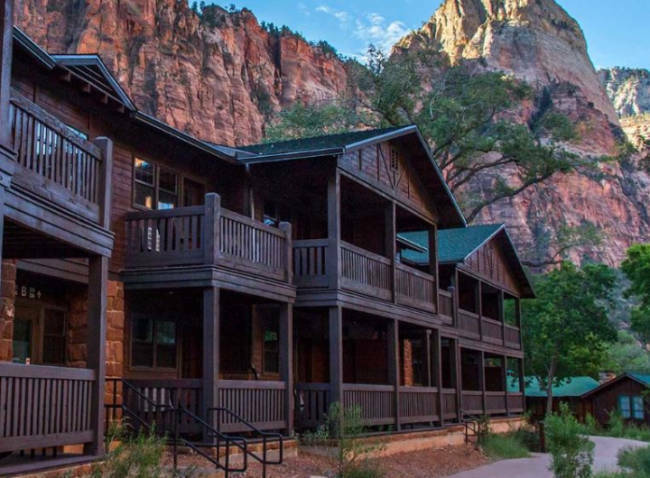 The majority of hotel rooms at Zion Lodge include two queen-sized beds (while a few rooms are available with on king-size bed. These rooms feature a full private bath and either a balcony or a private porch. Other amenities include a 37-inch flat-screen television with satellite reception. 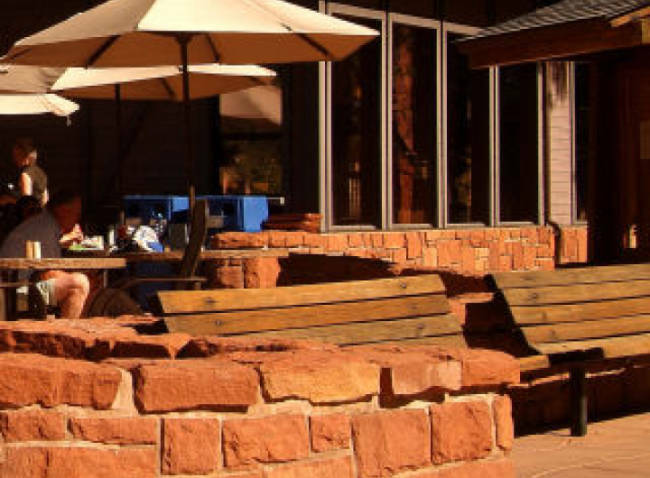 The hotel rooms are located in a separate building from the main lodge, but they are located within easy walking distance from the lodge as well as many hiking and walking trails. The Western Cabins have either two double beds or one queen bed. These cabins include a full private bath and a private porch. All cabins also include a gas log fireplace. These cabins are within walking distance of the main lodge. The Zion Lodge Suites are more spacious than standard rooms. These rooms include a sitting room, a separate sleeping room with a king-sized bed and a full private bathroom. Suites also include a wet bar with a small refrigerator, sink and faucet. All of the suites at Zion Lodge are located on the second floor they are within walking distance to the main lodge and many hiking trails. Rates Policy: Rates are based on double occupancy. Each additional guest age 17 or over is an additional $10.00 per night. Rollaway beds are available in some rooms for an extra charge of $12. Rates do not include the current tax rate, but they do include the NPS utility surcharge of $0.55. Rates, taxes and surcharges are subject to change.